The smartphone manufacturer Huawei launched the Honor 9 lite recently in India and it had been the best budget smartphone ever since. At that instant of time, Honor 9 lite had everything that a user was looking for (in the budget). 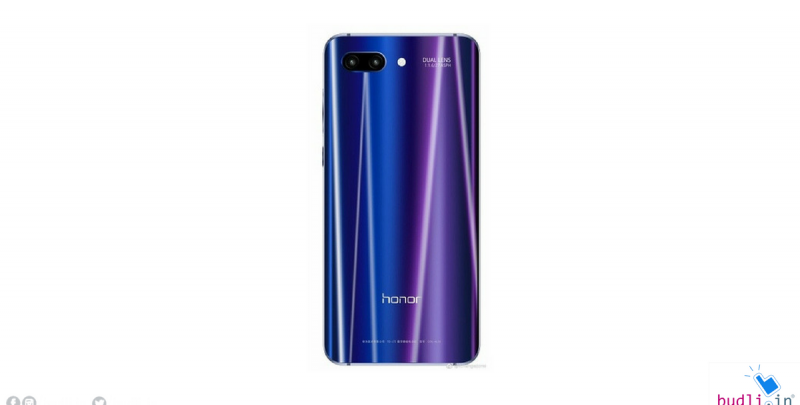 Now the smartphone manufacturer is ready with their new flagship Honor 10. Recently Honor 10 back panel pictures have been surfaced online. The pictures give enough details to understand the flagship design and most of the rumors about the design are confirmed. Now, let’s come to some conclusions after taking a look at the pictures of the which recently leaked online. The image shows the Honor 10 sporting a 5.8-inch full-HD with resolution 1080 X 2160 pixels. The leaks suggest us the phone will get a horizontal dual rear camera setup with f/1.6 aperture, and a quad LED flash. We can see Honor branding on the antenna lines on as well as at the bottom. Talking about the specification of new flagship – Honor 10, the device comes with a 5.8-inch full-HD+ (1080 X 2160 pixels) display and this flagship is powered by an in-house Kirin 970 SoC. The flagship comes with 6 GB RAM which can be expanded up to 256 GB of internal storage. The leaks reveal the company’s new Twilight color variant which is recently seen on the Huawei P20 and P20 Pro. The handset is going to make an official appearance in China this April 19 followed by a global unveiling next month. Huawei P20, P20 Pro, and the Porsche Design Mate RS are the new flagships which were recently launched in Paris. One of the smartphones, the Huawei P20 Pro is expected to launch in India soon. The P20 Pro comes with a triple rear camera setup which includes a 40 MP f/1.7 primary sensor, along with a 20 MP monochrome sensor as well as an 8 MP telephoto sensor. There are a lot of areas where the upgrade is really useful so in my opinion, even if there are slight differences, the company had made efforts to overcome it by some other added advantage. This makes Honor 10 a real upgrade to Honor 9 Plus. If you are looking for a place to find the best device at the best price then here it is – budli.in. Budli is the largest online store for refurbished electronic gadgets which gives you the best options from all the top brands across the world. If you think Budli is only for smartphones, then you are wrong. Budli has a wide range of gadgets to choose from smart watches to laptops to desktops n many more. You can easily upgrade to the device of your choice by enjoying great discounts offered at budli.in. Why spend more when you can get it for less at budli.in. Head to budli.in to bring home the gadget of your choice.